Following the previous post, which looked at the way different data types worked when transferring data between Excel and Python, this post looks at ways t0 get the best performance. Reads a range of 3 columns x 1,048,570 rows from Excel (this is 6 less than the maximum rows in a spreadsheet, in Excel 2007 and later). Writes the sum of rows array back to Excel to a range 3 columns wide (generating 3 identical copies of the array). 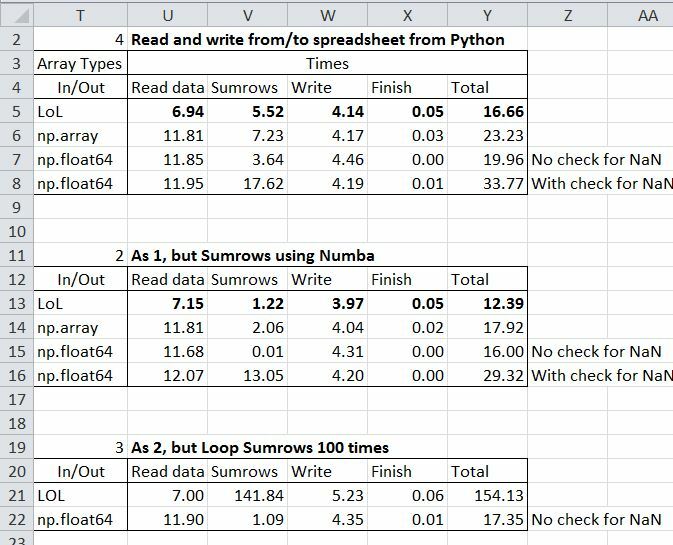 5 different combinations of array type (var, numpy_array, and float) to pass the data between Excel and Python. As 1, but using the Numba compiler. The data in the source array consists of numbers and blank cells, but no text. Note that the data range is declared as a range (rather than a variant, as I would normally do when working entirely in VBA). This is necessary to allow the full array of 1 million+ rows to be passed to Python, using “Application.Run”. In the first series, the fastest results were obtained using a var array for both input and output. The Sumrows time was significantly faster using a numpy_array, but transfer times were much longer. Using the Numba compiler significantly reduced the execution time for the Sumrows function in all cases, but the effect was very much greater when working with numpy_arrays, where the time was reduced by a factor of the order of 400! The much greater effect of Numba when working with numpy arrays was confirmed by looping through the Sumrows function 100 times. For this case the total execution time for the numpy arrays was more than 6 times faster than float arrays, and the execution of the Sumrows function was over 60 times faster. 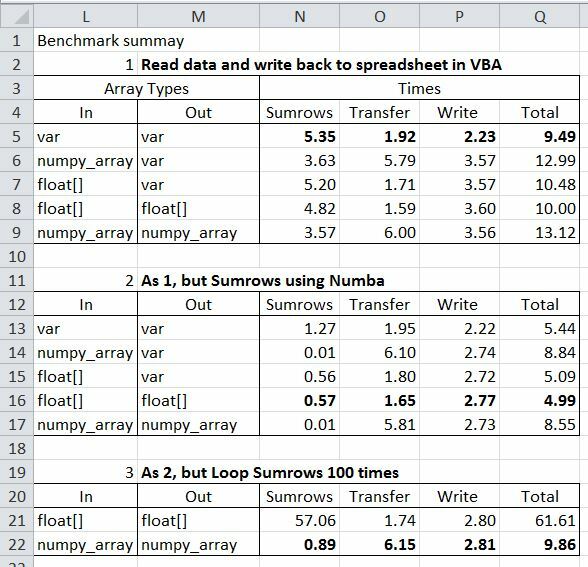 The time to transfer the data is of the order of 2-3 slower than working in VBA. When using numpy arrays the blank cells are read as either ‘NoneType’ or as ‘numpy.float64’ with a value of ‘nan’ (not a number). 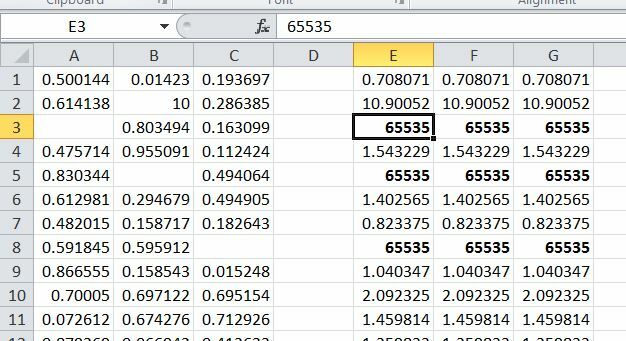 This results in rows with blank cells returning either an error or an incorrect value, so in the Sumrows function it is necessary to check for the blank cells. This greatly slows down the performance of the function, in the case of the runs compiled with Numba the execution time being increased by a factor of over 100! The results of using numpy arrays with dtype = np.float64 and not checking for ‘nan’ are shown in the screen shot below, where any row containing a blank returns 65535, rather than the sum of the two non-blank cells. Note however that if the data set contains no blanks there is a huge improvement in execution time by not checking for ‘nan’, especially when using the Numba compiler. When transferring large amounts of data, and where use of VBA is acceptable, read and write the data in VBA and pass it to Python using either Pyxll float or numpy_array data types. If significant numerical processing is to be carried out in Python there can be a huge speed improvement by using the Numba compiler in conjunction with numpy_array. If the numerical processing is limited the float data type may be significantly faster. If Numba is not used then the Pyxll var data type may be the fastest (but only marginally faster than float). If it is necessary to read and/or write from Python, and the data may contain blanks, either read the data to a Python List of Lists, or use a np.array and clean the data (by checking for values that are not of type “float”) before carrying out any numerical processing. If it is certain that there are no blank cells then read the data to a numpy array using dtype = np.float64, and use the Numba compiler. This entry was posted in Arrays, Excel, Link to Python, NumPy and SciPy, VBA and tagged Excel, improving performance, Numba, Python, PyXLL, transferring data, VBA. Bookmark the permalink. I know this is an old post, but just to let you know – passing floating point numpy arrays in PyXLL 4 is now significantly faster. If you need to pass a lot of data between Excel and Python or vice versa using “numpy_array” or “numpy_array” is now the fastest way (faster than var).